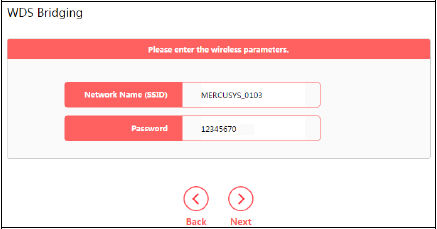 A Wireless Distribution System (WDS) is a system that enables the wireless interconnection of access points in a wireless network. It allows a router’s wireless network to be expanded using multiple access points without the need for a wire to connect them, as is traditionally required. 3. 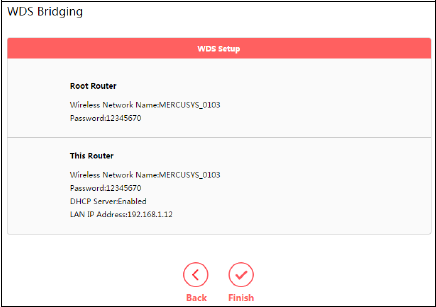 WDS bridging only requires the WDS setting on either the root router or the extended router, on either 2.4GHz or 5GHz; No need to setup this up on both sides or bands. 2. Under Advanced configuration, go to 2.4GHz Wireless→WDS Bridging, and follow the steps below to configure WDS bridging settings. 3. Click Next to start the setup. 4. Select a network from the table and enter the password, or you can click Add router manually and enter the network name and password. Then click Next. 5. Enter the wireless parameters of your router. It is recommended to set the same SSID and Password as the root router. Then click Next. 6. Check the parameters and click Finish to complete the setup. 7. The following information indicates successful connection. Note: If you have changed the LAN IP address of your router during the setup, you need to log in to the web management page using the domain name (mwlogin.net) or the new LAN IP you have just set.